DC Metro safety report: New Federal Transit Administration finds critical flaws in the capital's mass transit system. Management of the Washington D.C. Metro system was the subject of a “scathing” federal report released Wednesday. 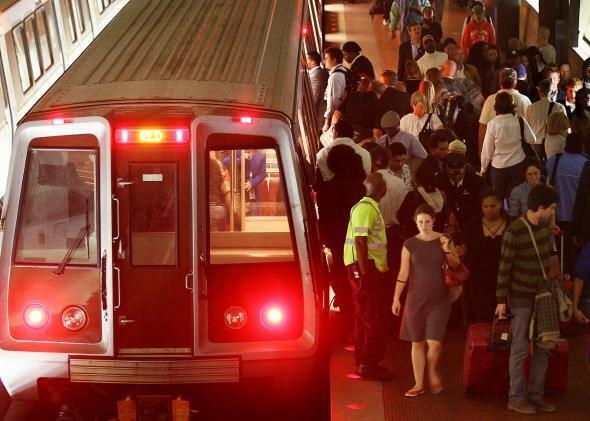 On Wednesday, the Federal Transportation Administration released a report detailing a multitude of safety, maintenance, and personnel issues in Washington D.C.’s mass transit system. Hours later, the system’s shortcomings were laid on display when delays blamed on a signal problem on the Metro’s Red Line led to dangerous overcrowding in several stations and essentially broke the evening commute for a large part of the nation’s capital. The FTA report was prompted by an incident in January that led to dozens of injuries and a woman’s death from smoke inhalation on board a Yellow Line train just outside the city’s L’Enfant Plaza station. An electrical problem known as “arcing” caused smoke to fill the tunnel and eventually the train, and it took transit employees and first responders more than 30 minutes to reach stranded passengers. Some of the problems laid out in the new report, including “dead zones” where radios are ineffective, could have contributed to the delayed response. The FTA inspection, initiated following the January smoke incident near the L’Enfant Plaza Station that killed Carol Glover and injured 86 others, details 44 official findings of problems with Metro’s rail system, and 10 findings for Metrobus. Each finding includes required actions that Metro must comply with, some of which are similar to issues raised after the deadly 2009 Red Line crash. Metro has 90 days to submit a plan to the FTA detailing how the transit system will address the safety issues. Some could take years to completely fix, and Metro has yet to complete all recommendations that stemmed from the Red Line crash. Among the findings, Metro doesn’t do enough track maintenance and only manages to squeeze in two hours of work during overnight repair sessions. Fans that ventilate the subway tunnels don’t always work. Critical components on the train and the track aren’t cleaned regularly. The report also suggests that greater power demand from eight-car trains has contributed to a rise in electrical fires. Even when controllers are on the job, the inspection found, it’s not clear that they are always focused on managing the trains. Officials noted that they often saw controllers using their cellphones while on duty, a violation of policy. The report also cites a high level of noise and distraction in the ROCC that contributes to errors, including instances in which trains were routed into active work zones and train operators violated red signals after miscommunication from controllers. As the report circulated Wednesday, at least one of Washington’s weary commuters was reading coverage of the FTA’s findings to pass the time while waiting for the Red Line delays to clear so she could finally get home.